Sunderland boosted their Premier League survival hopes with a deserved victory over an uninspired Manchester United. Wahbi Khazri put the strugglers ahead after three minutes with a free-kick from the left that eluded everyone. Anthony Martial levelled after he clipped the ball over Vito Mannone, who had parried Juan Mata's shot. But the Black Cats won it when Lamine Kone's header from Khazri's corner went in via a deflection off David de Gea to dent United's top-four bid. Reaction to Sunderland's win, and latest from Saturday's games here. Relive the Black Cats' crucial win. Listen to BBC Radio 5 live highlights. Will Allardyce's signings keep Sunderland up? Sunderland's win takes them to within one point of rivals Newcastle and safety after a game inspired by manager Sam Allardyce's January signings. Tunisia forward Khazri made his first Premier League start in their last game, a 2-2 draw with Liverpool where he assisted Jermain Defoe's equaliser. And the signing from Bordeaux was inspired again, scoring early on against United with a free-kick which Defoe stepped over to bamboozle United's defence and De Gea. And their winner - while credited as a De Gea own goal - was all thanks to the powerful header from Kone, a signing from Lorient. De Gea got a touch, with Martial appearing to hit the ball off his own keeper on the way in. Allardyce told BBC MOTD: "The new players have been on the list before January. The problem is can you get them here and do they want to come and join the fight? They were desperate to come here." Manchester United boss Louis van Gaal has been frustrated this week by media reports, including from BBC Sport, saying that Jose Mourinho's representatives have spoken to the club about their client replacing the Dutchman. Van Gaal had continued to insist that the club can finish in the top four, although the defeat keeps fifth-placed United six points behind Manchester City, who now have a game in hand. And, after the game, Van Gaal said it will be "very difficult" for them to qualify for the Champions League. The result has done nothing either to boost his chances of keeping his job. United dominated the final stages of the first half, but other than that they were matched or outplayed by Sunderland, who could have scored more. "Manchester United are no further forward than when Louis van Gaal arrived at the club. There has been no progression whatsoever. "So many media outlets have been going on about Jose Mourinho, Not one person from the club has denied it. That must be worrying." Manchester United now have seven defenders injured after they lost Matteo Darmian to a shoulder injury during the first half. On Saturday, the day before Valentine's Day, Van Gaal brought on the appropriately named Donald Love, a Scotland Under-21 international. The former Wigan loanee had a solid performance on his debut at right-back. The 21-year-old joined in United's attack at will and showed he was not overawed when he screamed at captain Wayne Rooney for over-hitting the return ball of a one-two. The 25-year-old was brilliant throughout, and caused United plenty of problems even outside of the two goals. On several occasions he dropped back and helped intercept attacks. 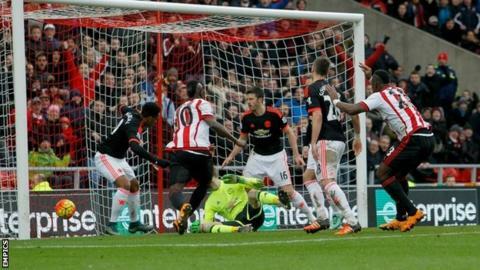 Sunderland recorded their first ever Premier League win against Manchester United at the Stadium of Light in their 14th attempt. United have earned fewer points this season than in any other Premier League campaign after 26 games (41). United have won none of the past seven league games where they conceded the first goal (D1 L6). Sunderland attempted more shots (including blocks) versus United than in any other league game this season (21 shots). The Red Devils have collected just six points from their past seven league away games (W1 D3 L3). Only Wayne Rooney (18) has scored or assisted more goals in all competitions for United this season than Anthony Martial (15 - 10 goals, five assists). Sunderland have gone 12 games without a clean sheet in the league, the longest current run in the division. Sunderland boss Sam Allardyce told BBC Match of the Day: "I thought the result was right. On the balance of chances created, a 2-1 win was no more than we deserved. "It shows the importance of set plays. We've found a lad who delivers a great ball. One, he's scored himself and the second ball for Lamine's goal was quality. "I thought Jermain Defoe was going to make it 2-0 and then Dame N'Doye got in one-on-one. We all prayed he would score. When he missed I wondered if it would be one of those days. "Everyone is very happy at the moment. I've sensed a commitment and a desire and will to get out of the problems." Sunderland have two weeks until their next game, away to West Ham, and are heading to Dubai next week for warm weather training. United will have no such luxury, as they face Danish side Midtjylland on Thursday in the Europa League, before an FA Cup tie with Shrewsbury the following Monday and the reverse European tie three days later. United's next league involvement is at home to Arsenal on Sunday, 28 February. Match ends, Sunderland 2, Manchester United 1. Second Half ends, Sunderland 2, Manchester United 1. Attempt missed. Patrick van Aanholt (Sunderland) left footed shot from the left side of the box is close, but misses to the left. Wahbi Khazri (Sunderland) wins a free kick on the left wing. Dame N'Doye (Sunderland) wins a free kick in the defensive half. Corner, Manchester United. Conceded by John O'Shea. Attempt blocked. Memphis Depay (Manchester United) right footed shot from the centre of the box is blocked. Assisted by Anthony Martial. Attempt saved. Memphis Depay (Manchester United) right footed shot from the left side of the box is saved in the top right corner. Assisted by Wayne Rooney. Substitution, Manchester United. Will Keane replaces Morgan Schneiderlin. Substitution, Sunderland. Ola Toivonen replaces Lee Cattermole. Own Goal by David de Gea, Manchester United. Sunderland 2, Manchester United 1. Attempt blocked. Lamine Koné (Sunderland) header from the centre of the box is blocked. Assisted by Wahbi Khazri with a cross. Corner, Sunderland. Conceded by Memphis Depay. Corner, Sunderland. Conceded by Daley Blind. Attempt saved. Memphis Depay (Manchester United) right footed shot from the left side of the box is saved in the bottom right corner. Assisted by Cameron Borthwick-Jackson. Corner, Manchester United. Conceded by Lamine Koné. Attempt blocked. Memphis Depay (Manchester United) right footed shot from outside the box is blocked. Assisted by Michael Carrick. Attempt saved. Juan Mata (Manchester United) left footed shot from outside the box is saved in the centre of the goal. Assisted by Morgan Schneiderlin. Attempt missed. Patrick van Aanholt (Sunderland) left footed shot from outside the box is high and wide to the right following a corner. Corner, Sunderland. Conceded by David de Gea. Attempt saved. Lamine Koné (Sunderland) right footed shot from the left side of the box is saved in the top left corner. Assisted by Wahbi Khazri. Substitution, Sunderland. Fabio Borini replaces Jermain Defoe. Cameron Borthwick-Jackson (Manchester United) wins a free kick in the defensive half. Attempt blocked. Juan Mata (Manchester United) left footed shot from the centre of the box is blocked. Assisted by Memphis Depay. Attempt missed. Wahbi Khazri (Sunderland) right footed shot from outside the box misses to the right. Assisted by Lamine Koné. DeAndre Yedlin (Sunderland) wins a free kick in the defensive half. Foul by Donald Love (Manchester United).